IRS Form 1099 is a necessity for individuals and independent contractors for reporting income other than salaries, tips and wages. The IRS form is used to report almost every income that filers will not report with the W-2 form. The team behind Tax2EFile has once again shown why they are recognized as a leader in E-Filing. A proven reputation with top of the line customer service and an easy to use E-Filing method makes filing at Etax1099.com a no brainer. The long days of filing at the IRS office will be coming to an end soon as the IRS even recommends filing electronically over filing in person. E-filing is a fast and easy process that will ensure the completion of the IRS Form 1099 in a matter of minutes. Filers will need nothing more than basic information along with the company’s EIN number to ensure a smooth filing process. The 1099 has many forms that Tax2Efile breaks down to make filing easier. The 1099 varies from miscellaneous income to even third party network payments. In general, the 1099 form is mostly filed if an individual or independent contractor earns $600 or more in a single payment of rent and other miscellaneous income. Any confusion that filers may have while filing will come to a halt with a simple click on the live support button. It has been proven year after year that the support team at Tax2EFile is one of the best. Take a look at the testimonials on their page, it speaks for itself. 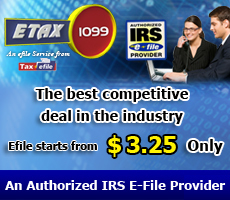 Tax2efile has been known to help filers maintain and submit various IRS Forms over the years with ease. A feature that filers from all over can appreciate is the Premium Service that they provide at an extra fee. The Premium Service feature ensures the completion of a filer’s form in a timely manner. The filer will need to just provide Tax2Efile with basic information and the team behind Tax2Efile will do all of the hard work. This feature is great if a filer is in a jam and needs help filing multiple forms before the deadline. Payments for the IRS Form 1099’s are due January 31st. The urgency for filing the IRS Form 1099 is important, the penalty for not issuing a form is a firm one that can charge the filer for about $100 per form. It is highly recommended that the IRS Form 1099 is submitted as soon as possible.